There is something about Shrimpers… I cannot get enough of them and find myself visiting them again and again. I love the dilapidated nature of them and even though they are in such rough condition they seem to venture out into the deep time after time. Perhaps they are a reflection of the men who sail them, rough hewn, salty men, eking out a living from the sea. Regardless, they are things of photographic beauty and deserve to be documented for history. You see, they are vanishing from sight. Shrimp seems to mainly come for fresh water farm ponds in the lower americas and soon these beautiful boats will be a thing of the past. The Japanese concept of Wabi-Sabi: “connotes a way of living that finds beauty in imperfection and accepts the natural cycle of growth and decay. Characteristics of the wabi-sabi aesthetic include asymmetry, asperity (roughness or irregularity), simplicity, economy, austerity, modesty, intimacy and appreciation of the ingenuous integrity of natural objects and processes. You had better get out and enjoy them while you are able too.. 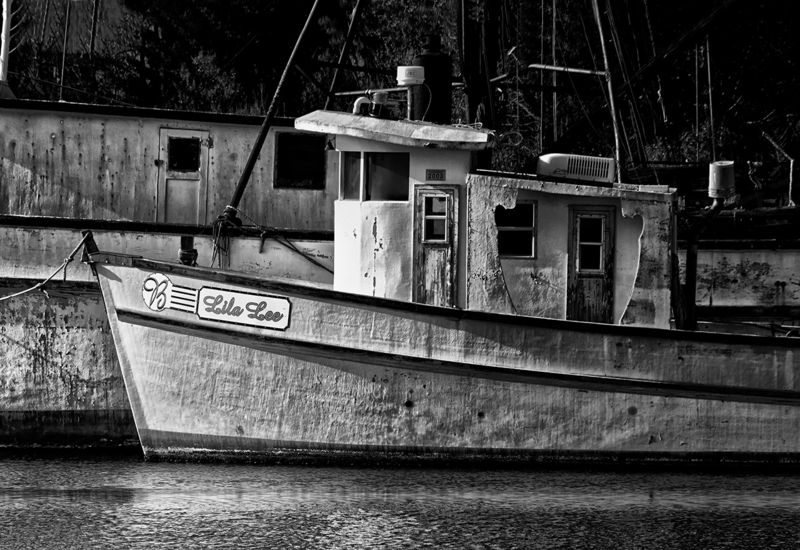 Here captured in Black and White, is a detail shot of the shrimper Lila Lee. She is resting in the boat grave yard in Georgetown, SC. The older shrimpers seem to be abandoned along the shore here in Georteown till they sink. We have some sitting on the bottom growing trees and weeds from their decks. Mark, can you climb on board for detail shots? That is a way to get shot down here in the south Jim! You can get close though, and with a long lens get your details.